And by right, I mean bad. But do you think I know why? Nope. No one has upset me, it's got nothing to do with my body being 'off' this month, I'm just in a punching mood. It's frustrating really, because I'm usually a pretty happy-go-lucky kind of gal. In fact, I'm quite often the one people come to when they need a pick-me-up or a good laugh. And I really like being that said person. However, every now and then, I have those days where I just want to sit in a dimly lit corner of some seedy, hole-in-the-wall joint, drinking my weight in chocolate milkshakes, eating my feelings, one Oreo Cookie package at a time, mentally stabbing the universe with a spork. Things that don't normally bother me suddenly gyrate my nerves something fierce or put me into ugly crying fits. Little things like when the toaster decides it doesn't want to pop up on its own anymore the one time I'm not standing within three feet of it, creating a thick cloud of smoke, the alarm to scream, burns my bagel to ashes, and stinks up the house for hours afterwards do not help my mood. And songs? Songs that I usually find endearing and sweet, even romantic are met with a, "GOODNESS GRACIOUS ME! GET OVER YOURSELF….AND HER! QUIT WHINING". Charming, right? Don't even get me started on my Autocorrect misfires. Just keeping it real, folks. And people don't make the situation any easier. Take a recent trip to the grocery store the other night. I was making my way to the till with my roughly 12 items in hand and my two tired kiddies in tow when, in the opposite direction and about the same distance away, Shopper X, armed with a fistful of coupons and a stacked, as in to the rafters cart of groceries was also making her way to the checkout. Instead of letting me go ahead, she puts a skip in her step and speeds up to beat me there. Nice, right? Then she turns to me, smirks and shrugs her shoulders. She knew what she did, yet she still didn't let me go ahead of her. Thank goodness my kids were there, otherwise she would have had a few choice words ringing in her ear and a metal cart shoved up her….leg. When it's all going down, I know it's happening, I just can't seem to stop it. I want to jump out of my skin and beat the snot out of myself. So yeah, my off days are not my funnest days. When they do come to town and you're in my path, I apologize in advance if I don't say hello and offer you a cold beverage. Also, please forgive the lack of a front door mat and the toothpaste-encrusted guest towels. Sometimes I think my life is a sitcom. I'm just waiting for someone to jump out and scream, "You're on Screw You TV!". It's unbelievable. You know what else is unbelievable? 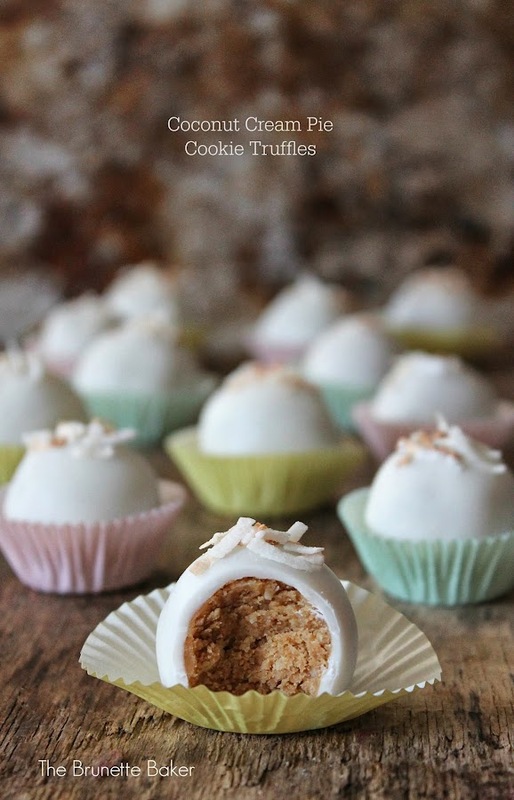 These cookie truffles. If you love coconut cream pie, you'll love my take on these. These are guaranteed to change that frown, upside down. Me? I'll be fine. Nothing that a good cry, a good night's sleep, and about ten more of these can't fix. Better make that 11. It has been a rough week. In a food processor, blitz cookies until they are reduced to crumbs. Pour into a mixing bowl and add cream cheese and coconut to mix. Roll into 2" balls and place on a boing sheet lined with parchment paper. Refrigerate for about 15 minutes. Place Candi-Quik in a heat-proof glass measuring cup and microwave in 30 second intervals, stirring between each interval until smooth and creamy. Dip chilled truffles into coating and place on parchment paper, immediately sprinkling with toasted coconut. Place back in fridge for about 15-20 minutes to set completely. aghhhh that's the worst-I hope your mood improves soon! It's no fun being angry! At least you have these truffles to comfort you-they're so creative and look super tasty!! I'm sorry you've had a bad week, but at least you had these truffles. They look amazing! I've had days and weeks when I've been like that, we are only human after all! I'm glad you you ended up finding some solace in those delicious truffles! Yummy! Hysterical, about the lady at the grocery. I bet she can't get her cookie balls and sweet and round as yours. They look so delicious and impressive, my coating never looks that smooth. Maybe I don't freeze them long enough? The little things sometimes get the best of all of us, take a deep breath and go to bed early, it's the time change, even springing forward can be rough. We all (okay, maybe not all of us, but I sure do) have those weeks - or heck, even months. But I'm fairly certain a batch of these would make it a little bit better ;). They look perfect, seriously perfect! I hope that this week is a lot better for you. Hugs. Where do you find Coconut cream cookies? What brand are they? That looks divine! My coconut flakes can finally be put to use!